I discovered this Dutch artist awhile back through Phoebe's blog. 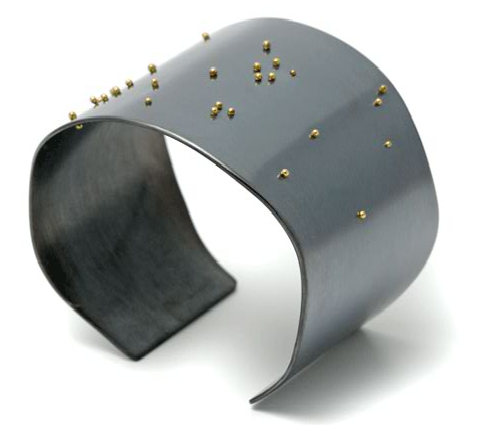 Nel Linssen has been creating extremely elegant, sculptural, and textural jewelry from paper for over 20 years now. The bracelet shown above (bottom image) was created in 1986. 1. I enjoy speaking in the 3rd person, especially to give myself props, as in: "Meg, you rock!" (always said facing a mirror). 2. I love to buy Greatest Hits Albums from musical artists who are under the age of 25. 4. I don't really get my inspiration from the things I post. My inspiration really comes from fortune cookies and occasionally a sip of Jack. 5. Tom on myspace really is my friend--we even had lunch the other day! 6. I take chain letter-type requests very seriously. Since this chain letter demand didn't come with any severe consequences (like your blog will evaporate into cyberspace dust if you don't tag 5 other bloggers) then I'll just end the tagging here. I know, call me a party-pooper! I'm a fan of objects made of humble, everyday materials, especially when designers take such materials to make elegant objects. 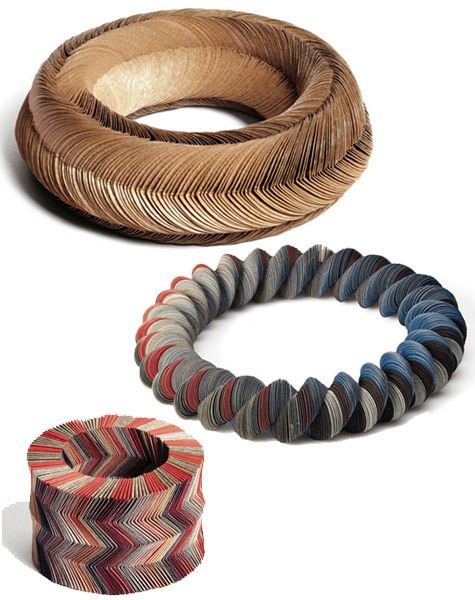 My latest obsession: jewelry that uses wood beads. I first saw Becky Lee's work at Relish at Home in Berkeley. (Kelly, the shop owner, has a knack for discovering some of the cutest things!) 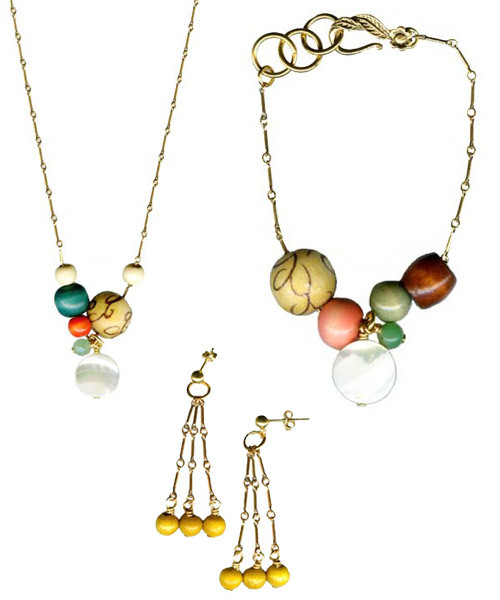 Becky plays with scale with different bead sizes in her necklaces and bracelets. 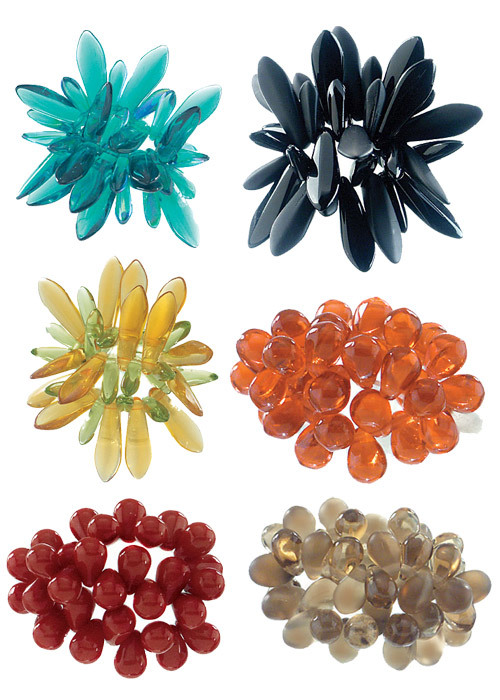 The composition of beads looks eclectic, casual, and arbitrary to stunning visual effect. 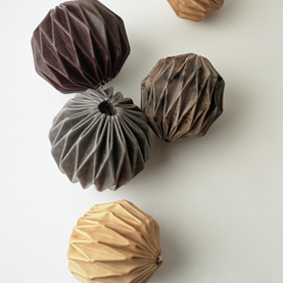 And I saw this designer, Malin Nyman-Smallcombe on DailyCandy LA today. She uses wood beads with jute rope (another humble material). Kinda reminds me of the necklaces my daughter makes in preschool (and yesterday on her play date)...but of course, these necklaces are far, far more sophisticated and innovative! Another lovely discovery from Joy. It was refreshing to see someone design an accessory that really plays with form and use. Refreshing because the form wasn't something immediately familiar or trendy, like let's say, a bird (however cute and irresistible they can be)... and it's just a nice break from alot of the surface design going on. Hey, I got nothing against surface design (I do that, too), but it's nice when people think about the object beyond merely slapping an illustration or pattern on it. And I like that Aiko's accessories work for both fashion and interiors. Lots of levels of thought at work here. My favorite line from Aiko's website: " I see my accessories as clothes that don't have to fit, which will suit all sorts of people for all sorts of reasons." Cool. These are the cutest rings designed by Dawn Benedetto for Poppi (based in Alexandria, Virginia). The rings are held together by an elastic device so that it fits nearly every hand--really ingenious and gorgeous too. 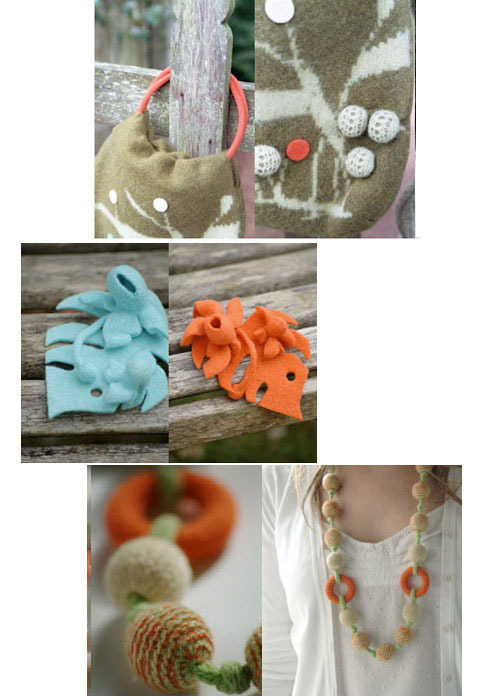 I love the Petal and Roe rings. They come in a vast rainbow array of vibrant colors making it hard to choose. 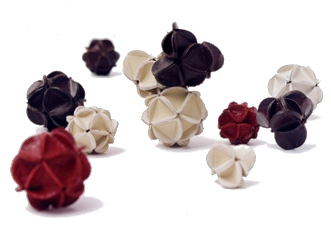 And the clusters of glass look almost good enough to eat--like candy! I was introduced to these rings by my friend Kelly, at her shop, Relish at Home...and still haven't gotten around to buying one yet! Sorry for the long radio silence. I've been in London & Paris for the past 10 days. We had a great time. It was an interesting experience, especially with a 3-year old and a 5-month old in tow. Of course, we didn't get to see everything we wanted to since the pace was considerably slower with all the bathroom and feeding pit-stops. From the moment we arrived at the Heathrow, Londoners were super kind assisting us with carrying our stroller up and down the stairs into the tube. I'll be sharing purchases/shops/discoveries from these two lovely cities for the next couple of days. This is a wallet I purchased from Calligrane in Paris (6 rue du Pont-Louis-Philippe, 4e arrondissement). Although Calligrane is a stationery shop spread across 3 boutiques, they also carried accessories like these gorgeous wallets. 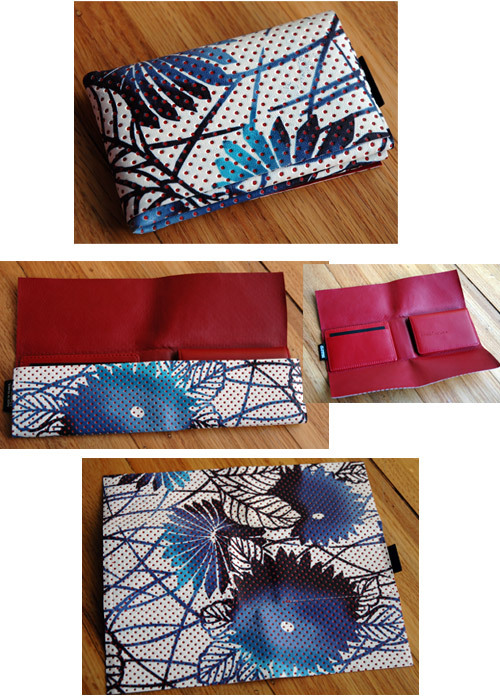 The wallet is designed by Accessoires de Bonne Compagnie. The images on their website don't do their products any justice--which is disappointing! Anyway, Calligrane had several different designs. There were tan and black leather ones with laser cut floral patterns. They were very cute but I wasn't feeling very laser cut at the time. This wallet is also made of leather with laser cut dots and a floral print. I love it's reductive style, the way it folds without requiring any closures and that it opens up so that you can view the entire pattern. It set me back 140 euros. Ouch. But well worth it. On their website, it shows that two shops (CT and CA) in the US carry their wallets. I'd love to go back to Paris and hit up the rest of the sights and stores I missed, including Musée des arts et métiers and Robert Le Heros. Carine (of Illico Design) told me is that RLH is a company owned by women. I thought it was a single man named Robert. haha. I guess I shouldn't talk since my company is called Mateo Ilasco and I've had people calling looking for a man named Mateo. Anyway, I'll be back later with more posts. I like Highway bags. I don't really know how to explain my attraction to them. 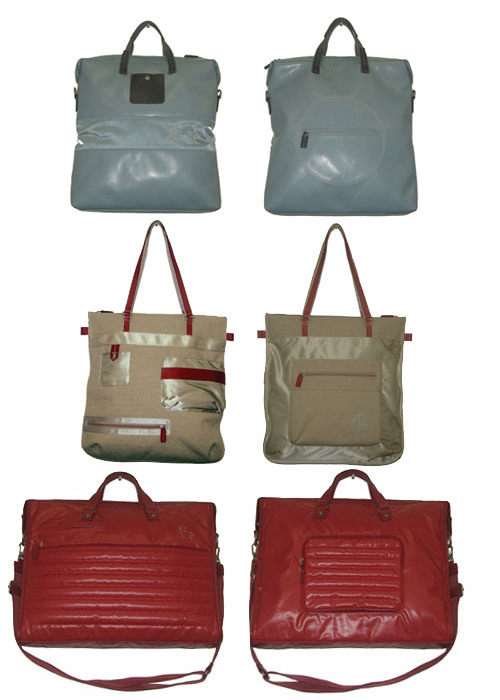 Let me try, um...: it's like the utility of a tool belt meets the functionality of an attache case meets the playfulness of totebag--all rolled into one! Does that make sense? Probably not. (I'm still a little loopy from the sample sale last Thursday.) Well, I love the play of texture between leather and nylon and embroidery. How about that? I'm definitely going to visit their store on my visit to NY!